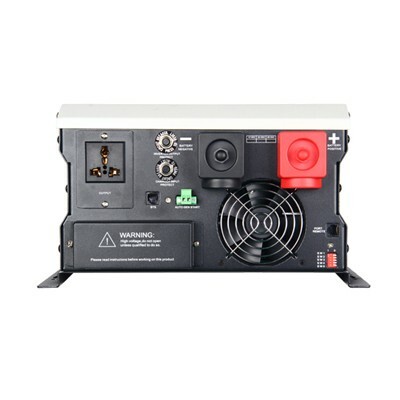 Soropower provides warranty against defects in materials and workmanship for its Uninterruptible power supply,Power inverter/chargers including inverter12v 24v 48V, Solar charge controllers (“Product”). Protection for low battery voltage, over load, output short circuit and over- temperature Restrain surge interference, eliminate noise, protection for thunder striking, provide the reliable power to theHome appliances. The series 5000 watt pure sine wave inverter has become the most popular solar powered inverters in the international market. The series inverter is based on the concept of modular, each photovoltaic group (1kW-5kW) through an 5000 watt pure sine wave inverter, the DC side has the maximum power peak tracking, parallel connection in the AC side. Many large photovoltaic power plants use a series 5000 watt pure sine wave inverter. Advantages are not affected by the difference between the modules and the shadow of the group, and the best operating point of the PV module is reduced. And the solar powered inverters do not match the situation, thereby increasing the amount of power generation. These advantages not only reduce the cost of the system, but also increase the reliability of the system. At the same time, in the group on introduced “- from” concept, the system in single on electricity can make single 5000 watt pure sine wave inverter to work in, several groups of PV group on contact together, let one or several work, to produce more electricity. The latest concept for several solar powered inverters to form a “team” to replace the “main – from” concept, so that the reliability of the system into a step. The control strategy of grid connected solar inverter is the key to the success of the grid connected photovoltaic power supply. 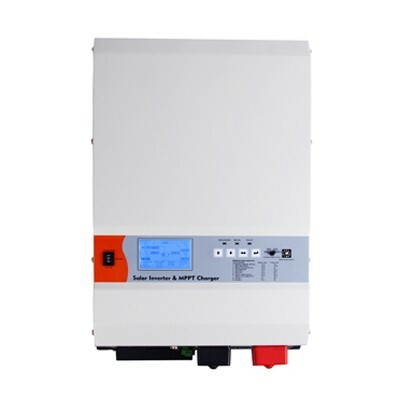 The control strategy of grid connected solar inverter mainly includes four methods: voltage source control, current source voltage control, voltage source current control and current source current control. Because when the input side using the current source control, need a large inductor in series, and this will make the dynamic response of the system becomes poor, so we usually use the source of the input terminal control, that is, a capacitor. In parallel operation of inverter and power grid, the output side control is divided into voltage control and current control. The network system is generally a large AC voltage source, when the output voltage control is used, the voltage source and the voltage source will occur in parallel operation. This situation is easy to occur the bad flow, and control will also relatively complex, so the output side of the current control method, it only needs track the grid voltage control of the output current of the solar powered inverter, eays to control. In summary, the control strategy of photovoltaic grid connected inverter with voltage input and current source output mode. Aiming at the voltage source current control mode, it generally has two ways, that is, current hysteresis instantaneous control mode and fixed switching frequency control mode. The current hysteresis instantaneous control mode is a kind of double closed loop structure with current control as inner loop and voltage control as outer loop. First, the difference between the outer ring and the voltage and the reference voltage through the PI regulator that reference current value, then the reference current value and the feedback of the actual current hysteresis comparison and make their deviation limit value within the specified range. When the deviation value is greater than the width of the hysteresis loop, the output current of the 5000 watt pure sine wave inverter can be controlled by the corresponding switching signal. By comparing the hysteresis loop, the actual current always keeps track of the reference current value. The characteristics of instantaneous current control is relatively simple, and the relationship between the width of hysteresis loop and the tracking performance of the current is great. Also switching frequency will change with the load current, which will made the uncertainty of the success rate of work and other aspects the switching frequency variation will cause harmonic frequency changes. This increases the difficulty of the design of the filter circuit. In the fixed off frequency control mode, the solar powered inverter adopts double loop control, that is, the outer loop voltage feedback control and the inner loop current feedback control. Can be seen that the reference current value is generated by a difference signal between a given reference voltage and inverter output voltage and the reference current value and the inverter output actual current value of the error value by proportional amplification and triangle wave of cross sectional control inverter disconnected. From the above analysis, it can be seen that the frequency of the inverter power switch is the triangular carrier frequency, that is, there is a fixed frequency. At the same time, because the control mode has a fixed frequency, the harmonic wave generated by the inverter is relatively fixed, which makes the design of the filter circuit more simple. In addition, when this method is used in 9 PV grid connected system, the outer loop is the feedback control of the output power of the solar powered inverter, which is more effective to reduce the grid connected circulation. Obtained through the above discussion of photovoltaic grid connected inverter topology and control strategy, two levels of non isolation type topology has many advantages, fixed switching frequency current control is more applicable in grid connected photovoltaic power generation system.